The new Will Smith vehicle Concussion is a frustrating experience. There is a lot of good to it, but so much gets lost in the Hollywood Studio rigmarole that we end up with a movie that feels sugarcoated to the point of being dishonest. It says at the beginning that this film is based on a true story. I believe that somewhere in Concussion is a true story, and if they stuck with that it would have made a much better movie than the one we are given. The first shot of the film is promising. We see a number of Bronze busts of heads from the Football Hall of Fame in Canton, Ohio as the opening credits appear. Football players heads are the focal point of this film and it tackles the issue of how much damage these players will do to their heads that gets them into the pinnacle of the sport, enshrined in the prestigious Hall of Fame. This movie has its flaws, but most of it does not involve the acting, especially Will Smith as the lead. Concussion is a showcase for him to show off his well rehearsed Nigerian accent. Lucky for us, he never breaks from it. Will Smith is consistent with his dialect as well as the emotions he conveys as he takes on the NFL. Albert Brooks is very good as his boss for the county coroner. 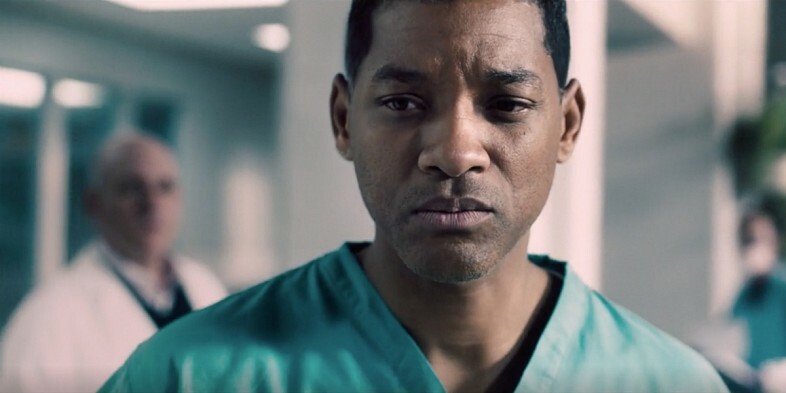 Brooks’ character is reluctant at first and then encourages Will Smith’s doctor character to continue on with his research as he studies brain damage to football players. The best performance in Concussion might be the reliable character actor David Morse, as a former Pittsburgh Steeler great that is suffering immensely now that his career is over and his brain severely damaged from years of hits to the head. He is only in the film for a few minutes but his short scenes resonated the strongest. The worst acting in the movie comes from the tragic miscasting of Luke Wilson as NFL Commissioner Roger Goodell, he looks and sounds nothing like the real person and as stated previously in my review for Ridley Scott’s The Martian, if anyone were to play Goodell it would have to be Jeff Daniels, who practically played him in The Martian, except he was in charge of NASA instead of the the NFL. The biggest problem with Concussion is that it went soft on the National Football League, to the point where the audience will be able to tell that the NFL was involved in the production. There is no bite to this film, no edge in its commentary about the effect the sport has on the men who play it. Overall, it just felt too safe when it should have tried to incite controversy. Nothing felt dangerous except that if you play football long enough, and get hit in the head enough times, you will suffer brain damage. Well no duh! And if you smoke cigarettes for a long time you will get cancer. What The Insider (1999) did for the tobacco industry, Concussion tries to do for football. Ironic because the script for Concussion is about as subtle as getting hit in the head with a sledgehammer. It feels like it moves very slow and some scenes go on for too long, especially in the final third of the movie. There was an abundance of Christian imagery and crucifixes. The director tries very hard to parallel Sunday Church with football and how the NFL replaced Sunday being a day to honor God and Jesus, instead is now a day in The United States where most people would rather watch a barbaric sport. The comparisons are heavy-handed and manipulative. The scenes that were most effective involve the actual science where Smith’s character explains what the continual hits to the head actually do to our brain as it floats in our skull. 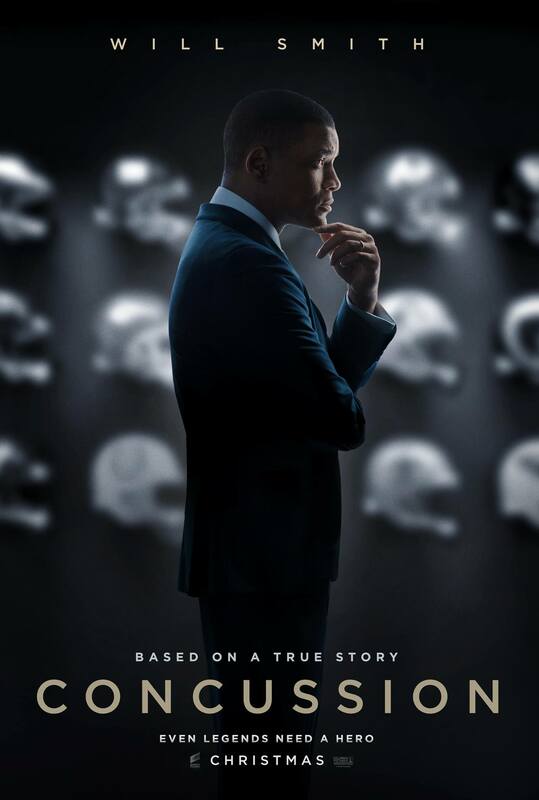 It was really powerful the way they actually showed that in the movie, and if it focused more on those scenes, Concussion would have probably resulted in a more informative, entertaining and worthwhile film. Instead, what we have is an after school special with A-list actors giving good performances on a script not worthy of their talents. The whole romance between Will Smith and Gugu Mbatha-Raw’s character was the least interesting subplot and would have been nice if I could have fast forwarded those scenes. It felt very forced and took away from the more intriguing moments involving our hero uncovering facts about head trauma and the NFL trying to marginalize Smith’s findings and cover up the real issue. In the end, Concussion would have worked better as a documentary with the way it was handled. The screenplay and direction are very self-righteous and try to make a powerful social commentary on America, but it lands flat. The acting is very good, but with so many better movies out in theaters right now, especially Spotlight, which also involves an investigation and cover-up by a large powerful organization, there is no reason to recommend Concussion. Here is the trailer for Spotlight, a much more powerful social commentary in theaters now.